CEOs are facing more challenges than ever as they try to establish influence within their industries, communicate effectively with internal and external audiences, and maintain corporate reputation. For John Sztykiel, CEO of Spartan Motors, one of the keys to a successful business - and in turn, one of the biggest challenges - is directly related to accessibility. 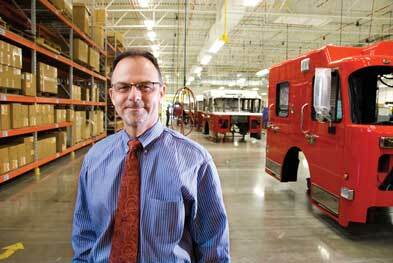 For the Charlotte, MI-based company - which engineers, designs, and manufactures heavy-duty custom platforms and emergency vehicles - part of that philosophy of accessibility is directly related to the fact that it has been a public company for more than 20 years. But the company's dedication to accessibility transcends the mere requirements; it's something that not only affects its communications strategy, but also impacts Sztykiel's and senior management's interaction with key stakeholders, customers, and staffers. "What we see as a challenge is that people expect accessibility to the key people within Spartan," says Sztykiel. "It's not a desire -it's an expectation. Moving away from that accessibility would be contrary to our culture." To ensure that level of accessibility, Sztykiel and his senior staff spend a great amount of time directly interacting with external stakeholders - whether it's attending industry association meetings, inviting different people to the facilities for on-site visits, or attending trade shows. "In our business model, influence is critical." he adds. "How do we do that? [I] spend a lot of time in an airplane [and] in a hotel ensuring that I... am accessible in the right places at the right time." Indeed, despite the growth of new/social media and advances in technology, it seems that old-fashioned, offline communications can still be just as, if not more, valuable for CEOs looking to establish themselves as influential within their respective industries - as well as with internal audiences. This year's PRWeek/Burson-Marsteller CEO Survey polled 144 CEOs about a variety of issues, including which tactics are most effective in establishing their influence within their industry, how they are communicating with both internal and external audiences, what effect corporate reputation has on recruitment and retention, and what steps they are taking to stimulate word of mouth about their companies. Nearly 70% of the CEOs surveyed came from high-revenue companies (more than $10 million in revenue a year). The survey reveals that 85.4% of CEOs believe it is "extremely important" or "important" to be perceived as an influencer in their industry. In terms of those activities that CEOs believe to be "extremely effective" at building their profile, the most popular tactics (both 78.5%) were "speaking at community events" and "communicating with my top customers." Other top answers included "speaking at conferences/ trade shows," "my involvement in corporate sponsorship," and "attend[ing] networking events with other CEOs" (all 72.6%). Recognizing the value of internal communications, 71.1% chose "interacting with employees." "Writing a blog" was at the bottom of the list, with only 37.8% viewing it as "extremely effective." "I think that online is seen as an additional way to have an ongoing relationship, but it's not a substitute for some baseline level of personal contact," says Mark Penn, CEO of Burson. David Becker, CEO of San Francisco-based Philippe Becker Design (PBD), combines online and offline activities to help establish his influence within the industry. "Like any company, we want to reach out to people that are our peers," he explains. "We want to be recognized by our peers for doing good work. We also want to get in front of potential clients at a high level that might not necessarily know a lot about our business. "I may spend a lot of time doing board activities in the business community to attract a certain type of client or build relationships," adds Becker. "Then [I] might spend time in online communities to connect with a younger demographic of potential employees." Adrienne Giannone, CEO of Bohemia, NY-based Edge Electronics, a franchised distributor of both commercial and military electronic components, agrees that although it can be time-consuming, participating in industry events has its benefits. Through her involvement in many association boards and participation in industry events and conferences, she says she has been able to establish her profile as a serious player in a competitive industry. "It gives you exposure and lets people know that you're part of the industry, that you're active [and] proactive in the industry," she notes. "You have to not only get out there and be seen, but get out there and share information." Giannone admits that she sometimes is surprised by the impact her profile can have on the business. When she recently got a call from an influential product line, she asked how they had heard about her company. As it turned out, the VP of the company, like Giannone, had been nominated for a Stevie Award, an honor that is not even related to the electronics industry, but is instead given to women in business. "Sometimes I think I waste my time doing that," she says with a laugh. "It was enlightening to me." Paul Spiegelman, CEO of The Beryl Co., a call-center company that provides outsourced customer service functions for about 450 hospitals around the US, says that while being seen as an influencer is not "inherently important" to him, he realizes the value it can have for the overall business. "I have realized that what I say, what I do, and how I am positioned does have positive value first for our people and secondly for the company and its growth," he says. "I can't deny that I represent what defines our culture... and to the extent that the marketplace sees that is very helpful." Spiegelman hopes to extend that influence outside of the industry. The company recently launched The Beryl Institute, a center dedicated to improving overall customer service in the healthcare sector. He also wrote Why is Everyone Smiling?, a book that promotes his company's people-centric culture. Most of Spiegelman's public appearances are not so much associated with Beryl, but are designed to establish him as a thought leader in the subjects of customer service and employee engagement. And even in an increasingly digital age, most of those efforts are rooted in traditional media or other conventional PR tactics. "I recognize [new-media's importance]," he says. "Yet to me, we're still in an analog business communication world in terms of influence. I spoke to MBA students a couple of weeks ago and got e-mails about how they took [what I spoke about] back to their businesses to help. That's the influence I'm looking for. It's much more personal. Nothing beats [face-to-face] communication." This way of thinking extends to Spiegelman's interaction with staff. "I try every day to walk on the call-center floor, even if it's for 15 minutes," he says. "That presence alone is very important to them." The survey found that on average, CEOs believe 41.4% of their time should be spent communicating face-to-face with employees. Those same CEOs report that they spend 43% of their time on average communicating face-to-face with their own employees. Spartan's Sztykiel notes that once every three to five weeks, the company hosts a CEO luncheon, where 10 to 15 employees from all areas of Spartan get an update on the company from a strategic and operational perspective. They also get to have some one-on-one conversations with Sztykiel himself. "It's critical to ensuring this accessibility," explains Sztykiel, who also encourages a "management by walking around" style among the company's senior executives. He leads by example, spreading himself and his staff around the company's vast complex. Indeed, a CEO's interaction with - and communication to - employees is often a goal for all companies. But for a company in the middle of a turnaround, maintaining a strong internal profile can be more important than being the most visible CEO in the industry. Gregory Burns, CEO of O'Charley's, which has casual dining restaurants across the Midwest and Southeast, notes that as the company continues its financial turnaround, his internal presence has been more vital than ever. "This is the first year that I've missed two major industry conventions," he notes. "I just prioritize things and say it's more important to spend more time with my people. I think my time is better spent in my organization. "It's not that I want people to look at me as the big shot," adds Burns, "but I think it's important they understand that there's someone at the helm. I'm not behind closed doors. Visibility within the company is very important. You can't just do it by e-mails. You've got to do it in person." For many CEOs, the importance of in-person communication extends outside of the company. According to the survey, when it comes to communicating face-to-face with external constituents, on average respondents said that 37.6% of CEOs' time should be spent in that manner. CEOs surveyed reported spending 35.9% of their time doing so. FreshDirect, a Web-based grocery and meal delivery service in New York City, has a prominent presence in the city because of its ubiquitous delivery trucks. It also has a highly loyal customer following. For those reasons, CEO Steve Michaelson believes that having a meaningful interaction with customers is essential. When the company recently sent out a statement of its environmental intentions for the next year to its customers, there was much feedback. Michaelson says he responded personally to many of them. "I choose to have a personal relationship and dialogue with my customers," he says. "It gives me a firsthand understanding of what's important to them. It is also nice that there are customers out there that have had the chance to communicate directly with the CEO." Michaelson takes that customer interaction a step further at least once a year. On the day before Thanksgiving, he and other senior executives are stationed throughout the city with coolers containing some of the most frequently ordered items. If for example, someone orders a pumpkin pie and receives an apple pie instead, it is Michaelson that will ring the doorbell to bring the proper item. "The fact that there are a variety of senior executives from FreshDirect making those deliveries... provides us with an opportunity for some legendary service and some stories that people will tell that are wonderful," he says. He adds that such an activity can not only impact the reputation of the company, but can also spark positive word of mouth. Encouraging word-of-mouth referrals among customers is something that should be top of mind for companies looking to grow or sustain business. According to the survey, 68.1% of respondents said their companies provide online tools for customers to tell others about their products; 60.4% provide offline tools for customers to do so; 54.2% collect information from customers to identify which have large social/business networks; 50.7% have designed a marketing program specifically to generate word of mouth; 46.5% have encouraged customers to post product reviews; 41% offer incentives to their customers to spread the word; and 38.2% have segmented their customer base to identify which may be the most effective at spreading word of mouth. Papyrus, a chain of retail stationery stores, identifies and targets a group of loyal customers with its Perfect Card program. Customers who are part of the program receive exclusive offers and are included in discounts often reserved for friends and family of employees. Such tactics, while not a formal, marketing-based word-of-mouth program, can ultimately have a great impact, says CEO Dominique Schurman. "We're hoping that through their experiences and engagement that they'll communicate that to other people," she notes. "We've always found that a referral or recommendation is the most powerful way for us to build customers." While CEOs stated that they are providing online tools to promote word of mouth and segmenting their audiences, it appears that most are not taking that segmentation seriously enough. When asked which customer segments are most influential to growing their business, 47.2% identified all customers as being influential; 27.1% said their biggest customers were the most influential; 13.9% noted that it was the customers that make the most frequent purchases; and 9.7% said it was customers that are most likely to tell others about the business. "I don't think people are creating enough segmented channels of communications to the many different kinds of customers," Burson's Penn says, adding that companies must open more extensive two-way channels with customers and also incorporate online tactics. "They've got to step up to more sophisticated ways of communicating to all their customers," he adds. "That approach will be well received in the marketplace." Mark Gumz, president and COO of Olympus America, notes that the company identifies several customer segments within its different businesses to find groups that can be considered influential to the company's future success. For its consumer business specifically, for the past few years the company has implemented the Olympus Visionaries program, which comprises pro photographers that use Olympus' digital cameras in their daily work. These photographers - including Jim Sugar, John Isaac, and Gary Cralle - are not only involved in helping develop new products, but are often put forth to speak about Olympus' products, most recently the E-3 digital SLR camera. Elmer's Products is another company that has a long-standing tradition of identifying influencers within its customer base and then targeting them accordingly to spread the word. For example, CEO Bruce MacDougall says the company has made a concerted effort to reach out to the teacher community with a variety of marketing efforts since its first campaign for back-to-school products some 60 years ago. "The people that created the promotions and advertising at that time did a tremendous job of penetrating that community of influencers to help ensure that the brand [message was carried out] to students and parents," he says. That tradition continues today as Elmer's maintains a network of thousands of teachers to which it communicates regularly, even developing products based on feedback from those teachers. The company's Web site, which was recently revamped, features a section especially for teachers with information that they can download and use in their work, indirectly spreading Elmer's brand message in the process. A dialogue with customers is one of the most important ways for a brand to establish loyalty and credibility, and typically PR is viewed as one of the most effective ways to do so. However, it seems that CEOs are appreciating the way in which PR and communications can impact other areas of business. When asked which areas of business, outside of internal/external communications, involved PR/ communications counsel, the most popular answer was "managing your corporate reputation" (70.8%). Other top answers included "recruiting top talent" (64.6%), "launching new products" (62.5%), and "developing company strategy" (59.7%). In fact, finds the survey, 77.1% of respondents view PR as "extremely important" to developing the company's overall strategy. "People are looking more and more to their PR firms for strategic counsel," says Penn. "We're a long way from the time when they looked for just media relations. [They're] really looking for a combination of services, most importantly including more strategy." Olympus' Gumz says that company views both internal and external PR counsel as an important part of the business. "We believe in PR and we believe in it as the foundation of our message," he says. "We look at our PR agencies as our partners - we include them in our planning meetings. We want them to understand what it is we hope to achieve and to be able to provide the foundation we build on. "We really believe that without a strong PR campaign or effort, the rest of the message is going to fall deaf," he adds. "I personally believe that and I think we've gotten that point across with our business people, as well." Of course, raising brand awareness is still viewed as the most important way PR and communications can impact the business. "We're using [PR] really to build our brand," says PBD's Becker. "For our type of business, I happen to believe that's the most effective use of marketing. We're not selling a $5 widget to millions of people. We're selling a long-term engagement - often several years - to a handful of clients. You have to get them to come to you and you have to give them a compelling reason to want to do that." Brand recognition and reputation can also help with another increasingly difficult challenge for CEOs: recruitment and retention of top talent. "Finding talent is really one of our biggest challenges," Becker says. "Being in a creative business, it's really about the talent." Becker is not alone in feeling the pressure of finding high-quality employees. The survey found that 63.2% of CEOs identified recruiting talent as a "very big" challenge at their company; 47.2% noted that employee retention was a "very big" challenge. In fact, 54.9% noted that recruiting talent has become a "much greater challenge" over the past two years, while 45.1% noted that the same was true for employee retention. "In general, business is working against the backdrop that working for big business is seen as less desirable and less secure than it used to be," says Penn. "Particularly for those businesses, it's making talent recruitment even harder." While FreshDirect's Michaelson says that finding talent for the company is a fairly straightforward process, he acknowledges the impact that the company's reputation has on the process. "I had a salesman in our corporate-office-services division tell me that when he goes to a party in his neighborhood and tells them that he works for Fresh Direct, he gets treated [like] a rock star," he says. "That's a great thing for your employees to play back to you. So the [company's] reputation helps us tremendously in recruitment." Indeed, the survey found that 83.3% of CEOs view a company's reputation for ethical practices as "extremely important" factor in recruiting talent. That ranks above other factors such as strong senior leadership aside from the CEO (80.6%), the CEO's reputation (79.2%), and the company's reputation for industry leadership (79.2%). "CEOs clearly understand that corporate reputation drives recruitment and that no one goes to a job interview anymore without Googling the company [first]," says Penn. "[Companies must] have a balanced corporate reputation between being a good citizen and being a good performer." Gumz interviews about 20% of the company's prospective employees - typically manager level and above. He says that the issue of the company's corporate citizenship is one that often comes up. Olympus has worked hard to establish practices that follow the principles of good corporate citizenship: half of the company's products are now considered eco- friendly and every building the company has built in the past three years has been a green structure. The company also supports volunteerism by its employees and donates money for the hours they volunteer for charitable efforts. "I think [good corporate citizenship is] increasingly important," Gumz says. "If you talk to people who are coming out of school today, these are the kids that have been raised... to be socially aware. We all know that this next generation is not necessarily going to work the [way the] previous ones have. Their 'life' time, their non-working time, is going to be incredibly important to them. What they do while they're at work has to complement their 'life' time." Penn adds that the fastest growing sector of employment in the country is the nonprofit sector because people want to do work that has a social impact. "So many young people are looking to play a socially beneficially role, as well as a financially rewarding role," he says. CEOs certainly are under an enormous amount of pressure these days, having to deal with a slowing economy, increasingly informed consumers, and the ongoing challenges of recruiting and retaining quality talent. So it is more important than ever for CEOs to have a focused and clear message for all constituents - whether they are employees, customers, business partners, or media. "The most important thing for a CEO is to really outline the vision of where he's taking the company, and for that vision now to include how the company is going to perform, how it [will] create great products, and how it [will] be a good corporate citizen," Penn explains. "I think people are looking for a vision to include all of those things. The days of just talking about the numbers are gone." The PRWeek/Burson-Marsteller survey on the importance of PR to CEOs was conducted by PRWeek and Millward Brown using the Lightspeed panel. E-mail notification was sent to approximately 522 corporate professionals and a total of 144 CEOs completed the survey online between September 11, 2007, and September 24, 2007. Results aren't weighted. This report provides selected highlights. Full results - offering some additional raw data - are available in Excel format for $150. Please contact irene.Chang@prweek.com .